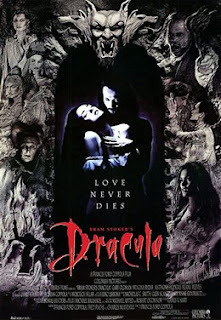 Tag line: "Love Never Dies"
It’s easy to get swept up in the excitement of watching Bram Stoker’s Dracula; the movie is so intensely stylish, so lavishly beautiful that its 2+ hours seem to pass in a fraction of that time. And yet, despite the exuberance it inspires, Francis Ford Coppola’s 1992 film is not perfect, and certain aspects of it simply do not work. In an effort to explain its title character’s “condition”, Bram Stoker’s Dracula opens in 1462, the year Prince Vlad Dracula (Gary Oldman) of Transylvania rode into battle against the superior forces of the Turkish Army. Despite the nearly insurmountable odds that they faced, Dracula and his men were victorious. But the celebration was to be short-lived; when Vlad returned to his castle, he found that his beloved with Elisabeta (Winona Ryder), who mistakenly believed he was killed on the battlefield, had committed suicide. Seeing as she took her own life, the priests informed Vlad that Elisabeta’s soul was eternally damned, which didn’t sit too well with the grieving Prince. In a fit of anger, Vlad renounces his faith in God, and as punishment for doing so is doomed to roam the earth for all eternity as an undead monster, one that must drink human blood to survive. Flash forward to the latter part of the 19th century. Real estate solicitor Jonathan Harker (Keanu Reeves) is sent by his boss to the remote country of Transylvania, where he’ll meet with the elusive Count Dracula to discuss his recent purchase of several homes in London, including the abandoned Carfax Abbey. During his month-long stay at the Count’s decaying castle, Harker comes to believe there’s something unusual about his elderly host, who sleeps all day and never eats or drinks. What’s more, Dracula has become obsessed with a picture of Harker’s fiancée Nina (also played by Winona Ryder), who the young man plans to marry the moment he returns to London. Harker’s suspicions about the Count are confirmed when, while exploring a darkened hallway one evening, he encounters Dracula’s three vampiric wives (Monica Bellucci, Michaela Bercu and Florina Kendrick), all of whom try to seduce him. Because he’s discovered his secret, Dracula has no choice but to lock Harker inside the castle when he departs for London, leaving him behind as a “snack” for his wives to nibble on from time to time. Soon after his arrival in England, Dracula (who, because he was able to feed during his long trip, is once again a young man) sets his sights on Nina’s best friend Lucy (Sadie Frost), with whom Nina has been staying while Jonathan is away. As Dracula slowly drains the life from Lucy’s body, one of her former suitors, Dr. Jack Seward (Richard E. Grant), sends for his mentor Dr. Abraham Van Helsing (Anthony Hopkins) in the hopes he will know how to treat the dying young woman. It isn’t long before Van Helsing realizes what’s going on, and with the help of Dr. Seward, as well as Lucy’s fiance Arthur Holmwood (Cary Elwes) and good friend Quincey Morris (Billy Campbell), he sets out to find and, if possible, kill Dracula before Lucy turns into a vampire. What none of them know, however, is that Dracula is romantically involved with Nina, who he’s convinced is the reincarnation of his beloved Elisabeta. And what’s more, he has Nina believing it as well. When she receives word that Jonathan, who escaped the castle, is being cared for in a Romanian convent, Nina rushes to his side, yet is unable to shake the deep feelings she has for the mysterious Count, who has, in the few short weeks they’ve spent together, become the love of her life. With its well-realized set pieces and excellent make-up effects (Dracula’s physical change, from an old man to a young one, is handled well, and at various times throughout the film he takes on the form of a wolf or a giant bat), Bram Stoker’s Dracula looks phenomenal, and its jarring camera angles, coupled with a unique approach to the narration (using diary entries and correspondences to keep the audience abreast of what’s happening), brings an energy to the film that remains strong throughout. Bram Stoker’s Dracula also boasts some incredible scenes (my favorites being the opening sequence set in 1462 and, later in the film, a confrontation in a crypt, where Van Helsing and his three accomplices have their first encounter with a vampire). Unfortunately, there are moments in the movie that come up short. During a storm (which was conjured by Dracula), a wolf slips through the bars of his cage at the zoo and runs off, yet aside from that brief moment, the animal never figures prominently in the story. Another missed opportunity is the character of Renfield, Dracula’s servant who’s been locked away in a sanitarium. Played by Tom Waits, Renfield appears only sporadically, and contributes very little to the final film. As Dracula, Gary Oldman is positively superb, handling the romance, drama, and horror with equal effectiveness; and even though Anthony Hopkins is a bit too flamboyant at times, he’s the only actor in Bram Stoker’s Dracula who comes close to rivaling Oldman’s screen presence. As for the younger leads, they’re more of a mixed bag. Ryder may not have been the ideal choice for Nina (I actually thought Sadie Frost’s Lucy was more interesting), but I don’t agree with those who say she delivered a bad performance (a late scene, where she and Van Helsing are alone at night in the Carpathian mountains, shows a more sinister side to her character, and she’s quite good in this sequence). Alas, all the criticism aimed at Keanu Reeves is justified; he’s lackluster at best, and his English accent is the pits. He even fails as a romantic lead; at no point in Bram Stoker’s Dracula did I want Nina to end up with him. Dracula may have been evil incarnate, and a plague on the world, but at least he wasn’t boring. The biggest issue I had with Bram Stoker’s Dracula, though, was how it handled the passage of time. Characters often travel great distances in what seemed like a matter of hours (when Nina leaves Dracula behind in London to be with Jonathan in Romania, she not only gets there quickly, but manages to marry him before Dracula even knows she’s gone). Yet the film’s various shortcomings did not spoil the experience for me. With style to spare, Bram Stoker’s Dracula is beautiful and disjointed, thrilling and flawed, and I look forward to watching it again in the near future.